Before we dive into this, I have to confess that I am not a native of Monaca. I actually grew up in Center Township, so I was able to relate to everything on Maura’s list of 10 Signs That You Might Be From Center Township. I guess the Center people I grew up with might think of me as a bit of a traitor, because as far as I’m concerned Monaca is the place to be. I’ve been living here full-time since the summer of 2008 and I’m currently in the process of purchasing a second house downtown to even further deepen my roots here. 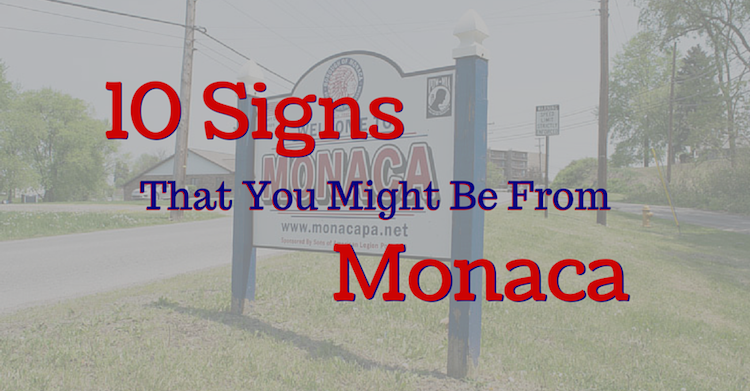 Between my experiences with friends and family from Monaca growing up and my first-hand experience living here for the past seven years, I’ve noticed quite a few characteristics that tend to hold true for most of the people from Monaca (myself now included). As a proprietor of one of those small pieces of riverfront property, I am guilty of pointing this out to pretty much anyone who will listen as often as possible. 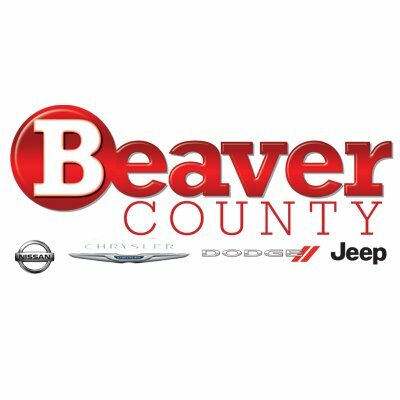 You can say all you want about River Road in Beaver, but they still have a road, a park, a hill, and train tracks between their property and the river. Here in Monaca, we are able to get right up next to the river. If you grew up here, you almost certainly had that one friend that lived along Atlantic Ave. And if you were lucky, their family had a boat or a jetski. The school district merger happened right around the time that I moved to Monaca, but you will still see quite a few Moanca residents rocking their old Indians gear today. Another thing that I’ve noticed about people from Monaca is that they tend to throw parties that are bigger than their houses can actually hold. Luckily, downtown Monaca offers plenty of party room options for your next family event. Whether it was your First Holy Communion at St. Johns, your High School Graduation Party, a Wedding Shower, or a Baby Shower, Monaca people tend to stay in Monaca and support our local clubs for these types of events. 4. You will argue that the waterslides were better than any public pool. For kids from Monaca, it didn’t get any better than the old waterslides. That’s where summer was spent and for some reason we never got tired of those same slides over and over. Center kids could have Chapel Valley Pool and Beaver Falls kids could say whatever they wanted about their wave pool…Monaca kids knew that the waterslides were the best summer attraction in Beaver County. The Battle of the Bridge was a huge part of Monaca culture for a long time. So much so that it made the Western Pennsylvania Sports Hall of Fame in the Heinz History Center. Every fall, the Monaca-Rochester football game would determine which town’s name would be placed first on the bridge for the following year. Of course, if you were from Monaca you called it the Monaca-Rochester Bridge all year every year regardless of who won the game. 6. You remember walking to get penny candy from Gallaghers and Oram’s Donuts from Nicol’s. There were always lots of cool places along Pennsylvania Ave downtown, but if you found yourself up in Monaca Heights, Gallaghers and Nicol’s were the places to be. These two little convenience stores have been keeping Monaca residence stocked up on household supplies for a very long time. I always knew that people in Pittsburgh did this, but I never actually saw it for myself until I moved to downtown Monaca. For many of us downtown, parking can be tricky. Many of us don’t have garages or any off-street parking. We get so used to parking on the street right in front of our houses that we start to think of those spots as our own. So when someone parks in your spot, you might be tempted to blow a gasket….especially on holiday weekends! 8. You agree that the Pump House is the only place to watch fireworks. Since we live right along the river, fireworks have always been a big part of Monaca culture. And the best place to watch those fireworks has always been, and will always be, the Monaca Pump House (that castle-looking building near the bridge). We used to all walk down to the Pump House on the Fourth of July, but now we congregate there for Beaver County BOOM! 9. Why is there a train coming EVERY SINGLE TIME I take 14th Street Hill? If you are downtown and want to head towards Monaca Heights or Center Township, there are two options: Wal-Mart Hill or 14th Street Hill. 14th Street Hill would always be the faster way to get up to the Heights, except for one problem: there is ALWAYS a train coming through that you have to wait for. There is a railroad crossing right at the bottom of the hill. This must be the busiest railroad crossing in the county because it seems like there is ALWAYS a train holding me up here. And if you happen to be late for work, that train is definitely going to make it worse. While the Monaca-Rochester bridge is the famous trophy bridge, the bridge a few blocks upstream has an interesting history as well. Years ago, you used to have to pay a toll to cross it. You think school busses are for wimps because you walked to school. You went to elementary school at St. John’s. You have been ticketed for parking on the wrong side of the road on street sweeping day. You have been ticketed for an expired parking meter downtown. You have “taken the kids” to throw money in the fountain. You remember when the laundromat was a pool hall.  Archived in Lifestyle, Stories and tagged 10 signs, archive, monaca.